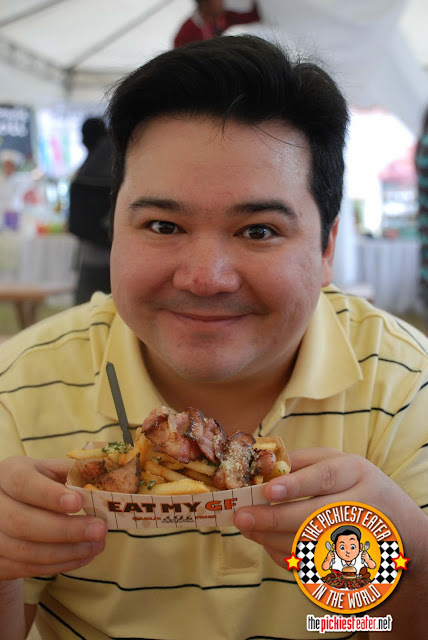 THE PICKIEST EATER IN THE WORLD: WEIRDEST REQUEST EVER: " EAT MY GF"!? Time to Meat My GF! I made my way to the food bazaar, "Best Food Forward" one weekend, just to see what they had to offer. Considering how big a part Food plays in my life, I try to visit events like this as much as I can. I would frequent Mercato Centrale and Legazpi Village Market a lot, so my standards for a food bazaar are very high. Rina wasn't with me, so I don't have very many pictures from the event, but I saw some of the old dependables that I would see in other weekend markets, like Manang's Chicken and Hero Sausages, among others. A booth that left me baffled was "King Sue".. You know.. the maker of the cold cuts that you buy from the grocery? A rather odd addition to the Food Bazaar scene was "Rufo's Tapa", one of my favorite local fast food chains (If you haven't had their Famous Tapa yet, you can't call yourself a Filipino). Apart from that, There was a food stall whose very name got me intrigued..
Kind of a strange name for a food business, right? But you've got to hand it to the owners.. they've got some major stones to come up with a controversial name like "Eat My GF" in a conservative country like ours.. So because of that alone, I just knew I had to buy whatever they were selling. And luckily for me, what they were selling, were French Fries - Something I love to eat.. No wait, let me rephrase.. Something I love to eat in great abundance. 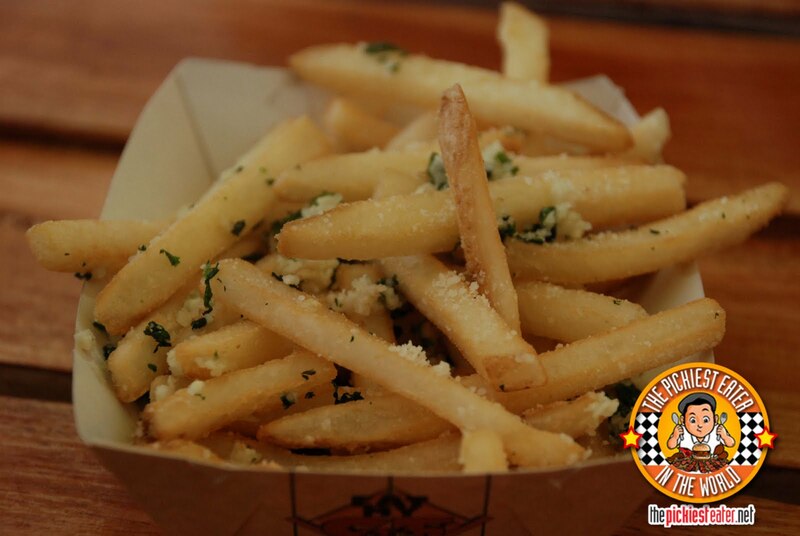 Not just any french fries though.. Garlic Fries.. Hence the "GF" (why, what were you thinking? Sicko.). 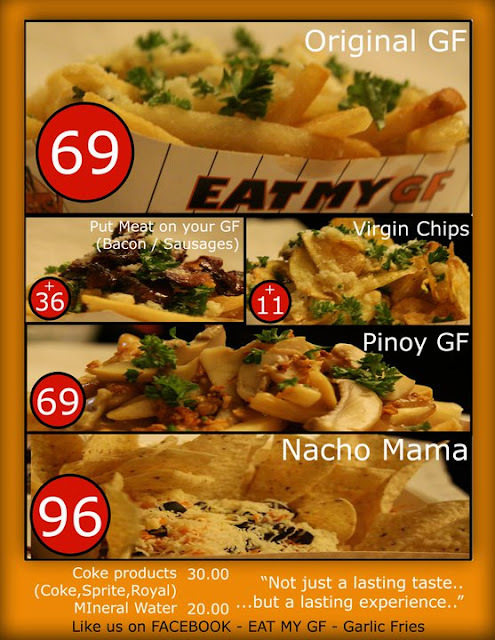 When Eat My GF tells you that they're selling Garlic Fries (P69), they mean business. In fact, the man who serves you will hand you some pieces of Mentos with every order of fries you get, and unabashedly will warn you, "You're gonna need it!". You see, this isn't the deep fried potato sticks stuffed into a plastic jar, then a spoonful of garlic flavored power is scooped in, followed by a furious shaking by the server. Don't be silly, that's not how Eat My GF rolls. I don't know if i'm right, but a certain type of oil (I'm not sure if it's olive) that has so much finely chopped garlic in it, it would make Edward Cullen crap in his pants (He IS afraid of garlic, right? ), is liberally poured unto some beautifully deep fried french fries. The garlic was chopped so finely, so that it wasn't cumbersome to eat. more than it being a "topping" the garlic served as a "coating" to the fries. And don't let the small bits fool you.. The flavor of the garlic packed a punch so potent, I was worried it would give the small bottle of mouthwash I had tucked in my bag a run for it's money. Now it's difficult to envision french fries any other way. The awesome part about Eat My GF is that they give you the option to put some "Meat On Your GF"... 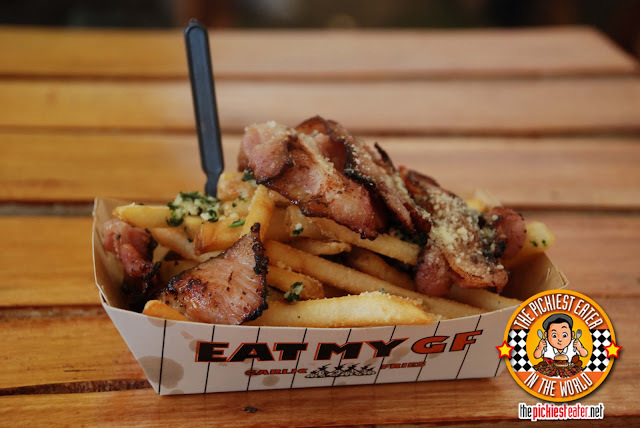 Meaning Bacon or sausages (Add +P36 to your P69 fries = P105). I got tunnel vision when ordering, so I meant to order one bacon GF and one Sausage GF, but the guy misconstrued my order, and gave me one plain one and one bacon. To be fair, it was my fault.. I was ordering while reading things out in the menu, and I may have said the wrong thing. hehe.. whoops (I can't think straight with the smell of bacon in the air, so sue me). How did it taste? It's garlic french fries topped with bacon.. How do you THINK it tasted? You top ANYTHING off with Bacon, and it's gonna taste awesome. Cheeseburgers topped off with Bacon? Awesome. Baked Pork and Beans Topped off with Bacon? Awesome. Merry Moo's Ice Cream with Bacon? Strange, I know, but still awesome. Sweaty Gym Socks topped off with Bacon? Ok- so maybe not ANYTHING, but you get my point. I don't know if it was just me, or the bacon they used was a slightly thicker cut. Either way, it definitely wasn't flimsy or too fatty (Although for me, the fattier the better). It was fried just right, so that the edges were slightly charred, but the meat itself let out a beautiful pinkish color (Yes, I used the word "beautiful" to describe bacon). 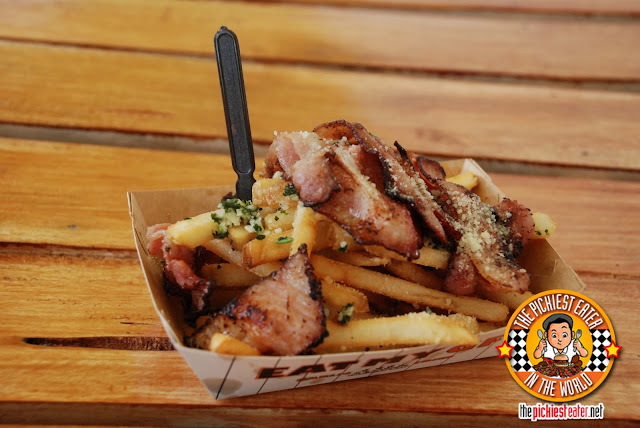 The smokiness of the bacon melded so wonderfully with the garlicky kick of the fries, that it could very well teach the world to sing in perfect harmony. Oh Cool! I found a menu online! incidentally, was there a LOT of bacon, or just sufficient bacon, or imaginary bacon? Haha thanks Anonymous Dude! I'm sure the owners of EMGF will be happy to hear you enjoyed it! Make sure you visit their ATC branch when you come back! Congratulations, Kim! You're doing much better now that you're asking people to put your sausage on your GF before they eat your GF. Haha Kim! That's a really cool uncle you've got there! They have the cheekiest name - but, in fairness, they do have the yummies, most decadent way of serving fries! Can't argue with you there, Midge! But just so you know, if the sausage is even half as good as the bacon, its totally worth every cent!